I love it when the Lord blesses me with one of those unexpected beautiful moments when the camera is handy. It's a photo gift. I was sitting near our sliding doors talking on the phone with my mother recently when I saw something large flying along the tree line and landing in a nearby tree. It took me by surprise and I had trouble spotting exactly what landed - IF it really landed at all. I grabbed the binoculars and searched. Finally, there it was - a Barred Owl. It blended in so perfectly that I never would have noticed it in the tree if I hadn't seen it flying. It sat there perusing the area for well over 30 minutes. Such a magnificent sight. It made my day. 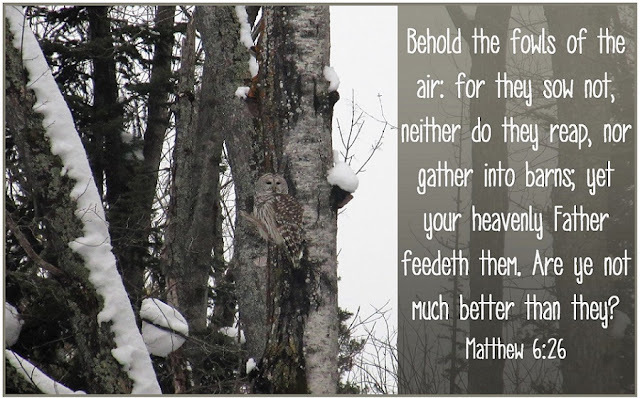 This verse immediately sprang to mind when preparing this photo for my Sunday Reflections post. I can still vividly remember the evening the Lord used this verse to speak to my heart when I was student teaching - like I was reading it for the first time. Little did I know how many times I would need to remind myself of this verse during the 6 months that followed. I needed that assurance that evening - that the Lord loved me and would always take care of me. I've also needed that assurance many other times in the years since, and the Lord has never let me down. It is beautiful when the Lord gives us reminders right in front of our eyes, or camera :) Have a blessed Sunday! So true! Thank you for commenting, Joanne. Oh I could have used this verse when student teaching as well! What a gift that Barred Owl was (and is)! What a surprise moment of love God gave to you. I am praying He blesses me as unexpectedly today too. My heart was very heavy that night, Jamie, not because of anything involved with student teaching, but because of events that were happening back at home in my family. The future felt very uncertain. God saw the big picture, however, and assured me that He was in control. I would have loved to see that owl with you! So beautiful! God brings me back to that verse often. We are studying the Sermon on the Mount in our small group. One thing we are learning is that confidence in God's love for us and care for us is a key to living out the beatitudes. Such a great point, Elizabeth! Confidence in Him! Oh what a beautiful encounter for you. It makes me think that often what we seek is right in front of us, we just have to pay attention.